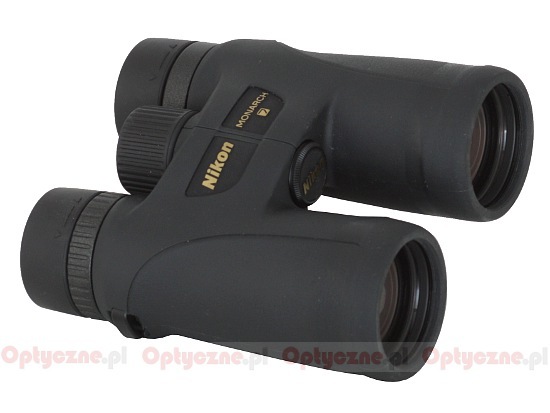 Nikon Monarch 7 8x42 - binoculars review - AllBinos.com . 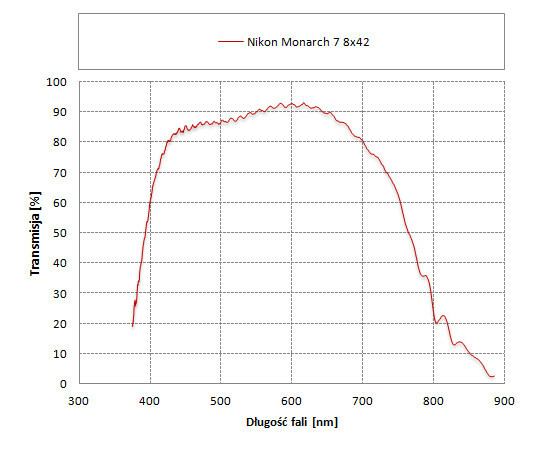 The Nikon Monarch 7 series was launched in the middle of 2012. At first only two models were offered – the 8x42 and the 10x42. Both instruments are Schmidt-Pechan roof prism devices and their prisms are made of BaK-4 glass covered by both dielectric and phase-correction coatings. In the construction of the Monarch 7 binoculars you can find low dispersion ED glass and wide angle eyepieces with large fields of view. All air-to-glass surfaces are supposed to be covered by antireflection multi-coatings and the outer elements are additionally protected by scratch-resistant layers. 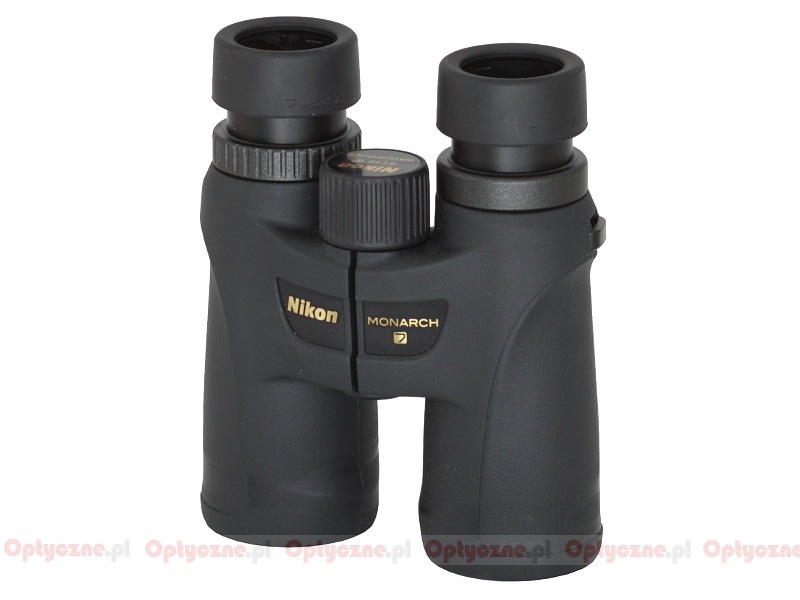 The bodies of the binoculars from this series are made of polycarbonate raisin reinforced with glass fibre and padded with rubber. They are submersible for 10 minutes in1 meter deep. The series is produced in China. The buyers get caps, a case and straps in the box. 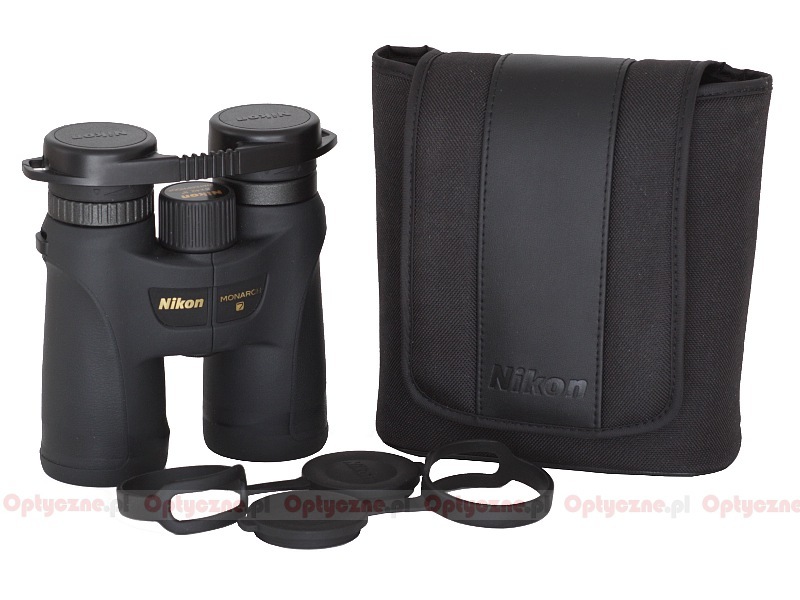 The binoculars from this series come with a 10-year warranty. 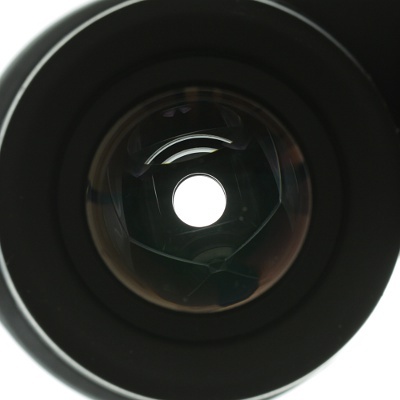 Apparent field of view of 65.8 degrees. clean and black inside the tubes. 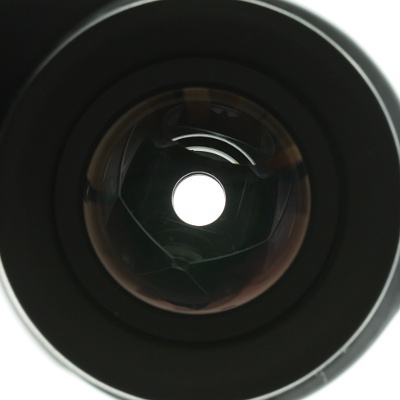 The Nikon company has lately swamped us with new roof prism binoculars. After launching the top-of-the-range EDG series they added Sporter EX, Prostaff 5, Prostaff 7, Monarch 5 and Monarch 7 as well. We were especially interested in the last instrument because, theoretically, it features everything a good, modern device should have. You get a nicely-designed casing, moderately heavy and fully waterproof. The parameters are interesting as well. The fields of view are wide, the eye relief – comfortable and the minimum focus, if not record-breaking, then can certainly be called sensible. Add to it low dispersion glass in objectives, good quality prisms with dielectric coatings and multi-layer antireflection coatings on all air-to-glass surfaces. If I had to compile a list of qualities that make up a perfect pair of binoculars I would include practically every feature of the Monarch 7 series. 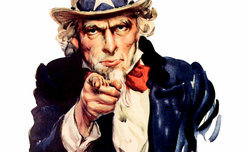 However specifications and claims of the producer are one thing, the practice is quite another. At the beginning we decided to check the parameters and compare them to those stated by Nikon; here we had no reservations whatsoever. The field is indeed very large and in perfect accordance with the specifications, the magnification a bit higher but still within the norm, the minimum focusing distance amounts to less than 2 meters. 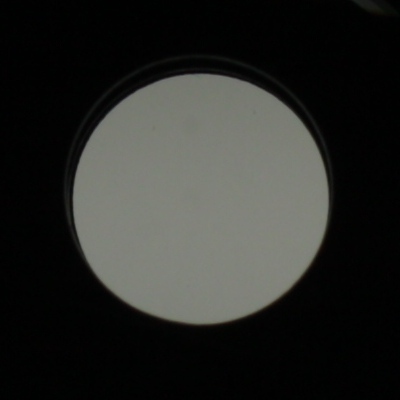 What’s more the objective lens’s diameter is exactly as it should be and the gauge between the tubes is sensible. Let’s pass to the optics. First, have a glance at the transmission graph which is presented below. You cannot call this performance outstanding but still it looks very sensible. In the red part of the spectrum the transmission reaches 92% which is a very good result for a moderately priced roof prism pair of binoculars. In the centre of the visible spectrum the transmission decreases to 88-90%, a value which still remains good. Only for blue and purple light the transmission level is a bit too low to meet our heightened expectations. 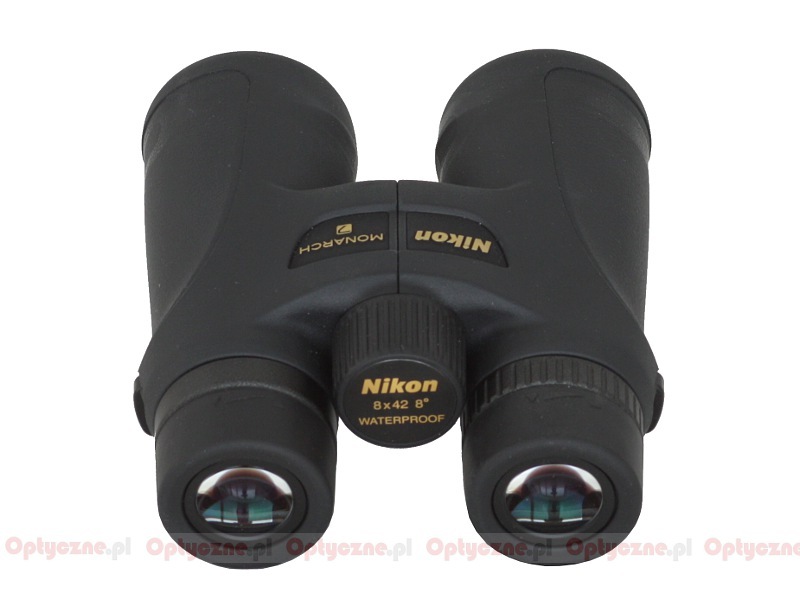 When it comes to the correction of most of optical aberrations the binoculars perform well too. Neither chromatic aberration nor distortion nor astigmatism will disturb you here; you can have just slight reservations concerning the coma which level is a bit too high. Still it is not easy to correct the resolution of such a wide field of view and the Monarch 7 wasn’t entirely successful but the result of 4 out of 10 points in this category can be still perceived as moderately good. When it comes to the optics I like this pair of binoculars well enough. In my opinion a wide field of view, corrected a bit worse on the edge, is far better than a narrow keyhole, be it even perfectly corrected from rim to rim. 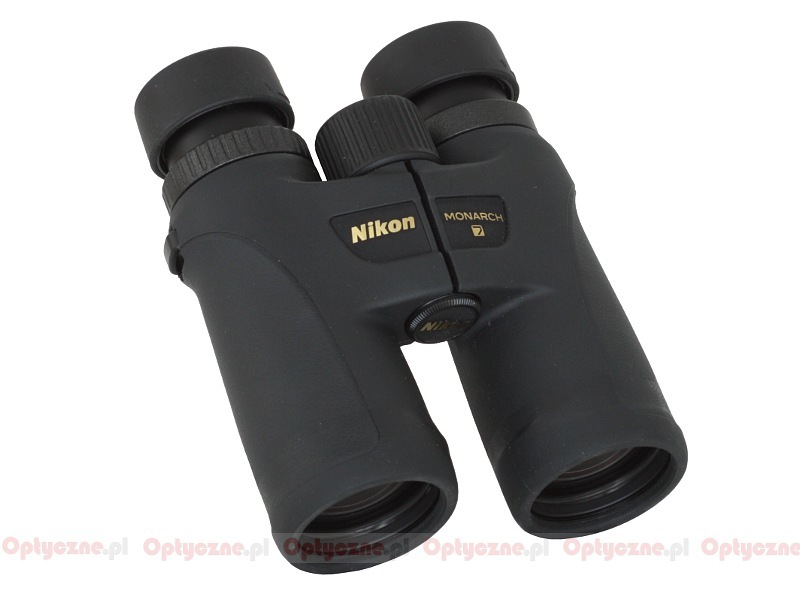 It is worth noticing that a lot of 8x42 binoculars, tested by us so far, feature fields as small as 6.-6.5 degrees. Compare to that the 8 degrees of the Monarch and you have to admit it is a serious advantage. The build quality worries me the most. So far the price division point between China-produced binoculars and those made in Japan has been situated near 300-350 Euro. You could still find solid 42 mm roof prism devices produced in Japan even cheaper than that. Now the limit is shifted and both Monarchs 7 are the proof – they cost significantly more than 300 Euro and they are made in China. The saving on build quality and quality control can, unfortunately, be noticed. Not very well adjusted rubber of the padding, too loose gauge of eyepieces, a bit egg-shaped exit pupils, a tad too shiny paint inside the tubes. Such flaws can be forgiven in the case of cheap roof prisms devices, perhaps even those which cost about 200 Euro, but when you reach the level of 400-500 Euro you should expect something better. Mind you here you deal with an optical instrument from a reputable producer, a company which has been manufacturing binoculars since 1917 and is boasting one of the most interesting offers on the market. Noblesse oblige.